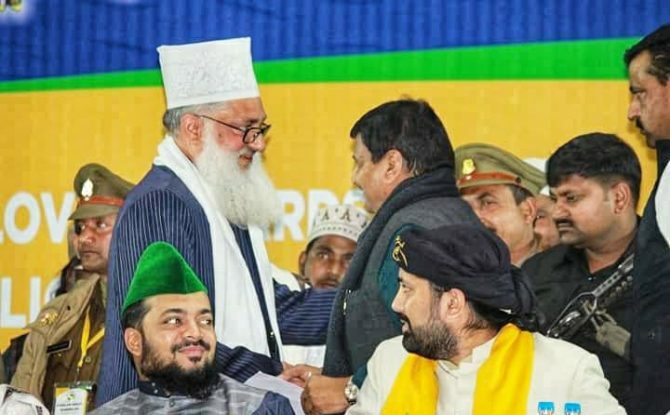 Country cannot progress if proper and equitable representation is not given to Minorities and backward communities in jobs and government, said Syed Ashraf Kichchawchchvi President of All India Ulama & Mashaikh Board in a largely attended programme in Lucknow. Displaying a rare opportunity of Muslim Intellectual gathering in the Capital city of Lucknow, speakers from all prominent DARGAHS expressed their views and community voice. Syed Salman Chisty, Gaddinnashin from Ajmer Dargah and founder president of Chishty Foundation laid emphasis on equal distribution of power and participation. “”It’s not possible that one man holds a Marshall and the the other power in this today’s world”” this will lead to confrontation. Ashraf Mia of Kichchawchcha sharif, President of the Board that merely promises will not solve the problems of the community. Actual participation of jobs, and other fields will will lead to justice then. He said that India being a democratic Country where people’s have the great and important voting power, Minorities have always been cheated .He questions with the government as to why Article 341 has not been resolved as yet. Syed Ale Mustafa Pasha Sajjadanashin from Hyderabad and Syed Naseeruddin Chisty, Syed Farid Nizami of Nizmuddin Dargah, Delhi, Syed Tarvin Hashmi of Bijapur Dargah and Ammar Ahmed Hashmi of Radauli sharif and Sajjadanashin Makanpur Dargah, also expressed their concerns at justice not being given to Minorities and backward classes. Intellectual from all walks of life gathered ,gathered to express their anguish. Shivpal Singh Yadav ,President of Pragathasheel Samajwadi Party (Lohia) supported the conclave and promised equal participation from his party to them. He also mentioned that he himself was hounded by the government after the Babri masjid demolition to the extent that he went underground for 6 months. Criticizing the Union government on failure on all fronts he said that we should think above religion, caste, communities and only then country development take place. He strongly condemned the recently statement of Shiv Sena that Muslims should get divested of voting rights. India belongs to both Hindus and Muslims to gather, Shivpal Singh said. The vast gathering of Muslims leadership and intellectual, on a single platform;, which was supported by various political outfit also fathers prominence. In view of 2019 elections all the political parties thus conclave will make them take notice of it .Equal participation as bhagidari is a must and government cannot ignore this major demand of them.